Those who work in medical facilities understand the importance of custom lockers when it comes to keeping their personal belongings safe and secure for extended periods of time. After all, working long hours in a high-traffic environment demands a specific type of secured storage solution in order to prevent theft or loss. Custom employee lockers fulfill those requirements, and the right custom lockers will do so while maintaining cleanliness, convenience and style. Security. Hospitals, by nature, experience rather high traffic. Hospital personnel and patients are present in the buildings 24 hours a day, seven days a week. Under such circumstances, finding the right place to secure personal belongings can be challenging. 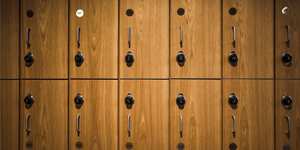 Custom lockers provide security whether the facility assigns them or simply makes them available to staff. Organization. In a high-stress environment such as a hospital, it is imperative that staff members keep their belongings organized in one place. With crowded hallways, break rooms, and locker rooms, providing employees with spacious custom lockers that suit their needs eliminates the issues that come with space constraints in a busy location. Privacy. Privacy is an important component of locker provisions in a medical facility, which is why hospitals use a variety of locking mechanisms for lockers. For example, some lockers may include a simple lock and key; others can include more complex locking mechanisms designed to protect an employee’s privacy. Cleanliness. The use of custom lockers in hospitals contributes to maintained cleanliness, as the slope top or dropped soffit above hospital lockers enable staffers to maintain a dust-free locker. Also, lockers tend to be made of materials that are easy to clean and maintain, thereby contributing to a more hygienic space. Peace of mind. Lockers in hospitals provide an overall peace of mind for staffers who concern themselves with security, privacy, and organization issues. Without quality storage for hospital personnel, chances are that the instances of theft and loss could increase, resulting in higher stress levels and diminished overall job performance and quality of service. Legacy Lockers specializes in custom lockers and installations in a variety of facility applications, including medical facilities. 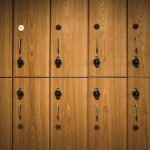 To learn more about custom employee lockers, visit www.legacylockers.com today. Where Do You Begin With Custom Lockers?